Комплексно-хвильовий урок з англійської мови на тему: "Весна". Проведений в 5 класі. Мета: Ознайомити з новими ЛО. Удосконалювати техніку читання. Розвивати навички монологічного й діалогічного мовлення. Тренувати у письмі. Розвивати ерудицію учнів. Виховувати дбайливе ставлення до природи та власного здоров'я. Ps: We are fine, thank you! Aim 2. Повідомлення теми та мети уроку. T: Today we’ll speak about animals which can be extinct; discuss the reasons of this and the necessity to save these animals. And will remember about our health. 1) Повторення чанту «It’s Got to Be Somewhere». Кілька пар учнів по черзі інсценують чант. Учитель стежить за правильністю вимови слів. T: Do you consider yourself an animal lover? Do you have any pets? Do you ever talk to your pet? If so, what do you say? Do your pets have special behaviour problems? Do you know someone who owns an unusual pet? Are there animal rights groups where you live? Can you name some endangered species? Do you think it is acceptable to test cosmetics on animals? How do you feel about the use of animals for medical research? Do you think it is okay to eat meat? Do you think people should buy and wear fur coats? Have you ever eaten rabbit meat? Have you ever gambled on a horse race? How do you think does imported to save nature for our health? Пояснення складних або не зрозумілих слів. We make a sport every day. Torn around, clap, clap, clap. Your left leg`s up and down. Учні самостійно читають текст і виконують завдання вчителя. 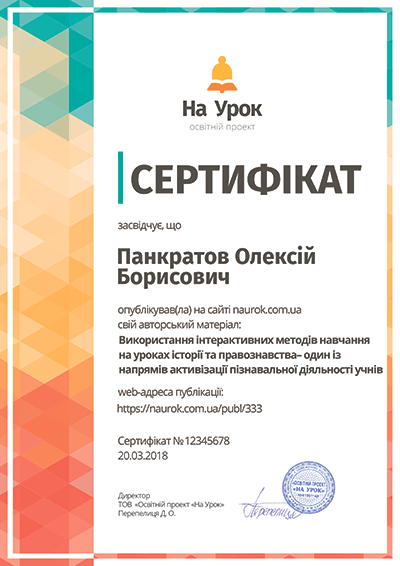 (Робота в парах.) Discussing this questions and write answers in your copybook. (Робота в групах)Discussing in groups. What gives for our health animals, trees, flowers so if to say only one word it`s nature? T: What did we discuss at the lesson today? What endangered species can you name?